There is a beautiful outdoor braai area, looking on to Cathkin and Champagne Castle mountain peaks. "The Little Berg, where Dragon Peaks is situated, is a land of singing streams and whispering forests, a land where liquid bird calls greet the dawn, and where the yelping cry of the Jackal Buzzard breaks the noonday silence, where the diapason organ notes of the thunder roll amongst the crags, and where the winds sing their immemorial song amongst the tall trees of the forest." - 'Barrier of Spears' 1973. This is where we are blessed to live. Dragon Peaks has been the home of the Tungay family for four generations, since its purchase by Ron and Gwen Tungay in 1955. My wife and I took over the Manor House, that was once my grandparents' home, and have converted its two large wings into self-catering units. In our mind, Champagne Valley is one of the most majestic places on earth. Its place in the Central Drakensberg is a must-see for any visitor to South Africa. This all said, Shannon and I love to travel and explore so we are often away from home. We are situated in Champagne Valley of the beautiful Central Drakensberg of South Africa, on the property of Dragon Peaks Mountain Resort, which borders the UNESCO Maloti-Drakensberg Park (uKhahlamba), listed as both a cultural and natural world heritage site. Orchard Manor is set amongst two fruit tree groves on a hill side above Mount Champagne and the Drakensberg Boys Choir School. Situated five minutes drive by private road from the reception, Orchard Manor offers the perfect retreat for those seeking privacy in the mountains. 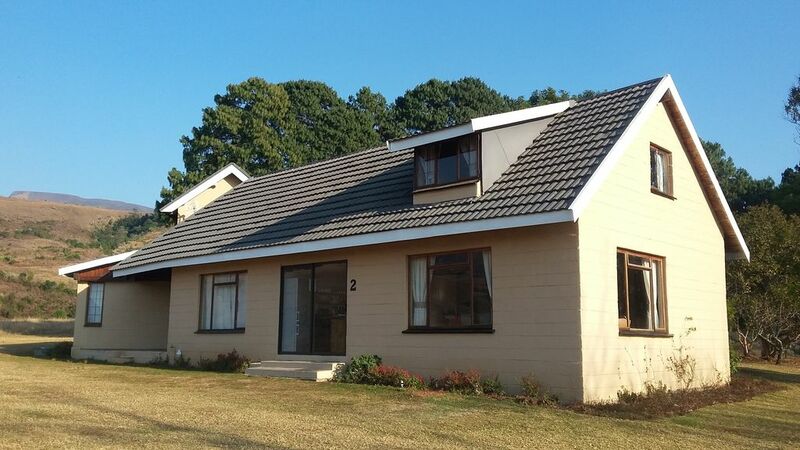 Orchard Manor contains two fully equipped, self-catering units that sleep 5 and 6 people respectively, with each unit situated on opposite ends of the Manor. Walking out onto the spacious back lawn, guests find themselves met with commanding views of Cathkin and Champagne Castle mountain peaks. Guests have the benefit of full access to Dragon Peaks Mountain Resort with its wide range of activities and facilities. These include a restaurant, Oaks Superette, hiking trails, swimming pool, tennis courts, the Adventure Centre, horse rides, mountain bike trails, and Westline Aviation helicopter flights. For a full range of facilities on offer, please see Dragon Peaks Mountain Resort. The unit also has free wifi. Utilised on your behalf by the maid for a fee of R100 per load, including drying and ironing.